The Debbie Curtis Big Band & Swing Orchestra, based in London, UK, are an international performing and recording band, bringing you not only the music of past jazz and swing Big Bands, but taking the music genre forward with affection. Here you will find details of how to hire, listen to CD's, downloads, get news, view pictures and film, see the musical arrangements At o Z and a lot more. The band have performed concerts at some of the UK's most prestigious venues such as the London Palladium, Her Majesty's Theatre and The London Savoy. All are fully professional musicians. Big Band refers to a jazz group of ten or more musicians, featuring three to five trumpets, two to five trombones, four to five saxophones and the "rhythm section" which is a combination of piano, guitar, bass and drums. A Big Band may also include a "String Section" of violins and cellos. The most common combinations are known as 5/4/4/4 or 5/4/4/3 depending on the structure, often determined by the "Musical Arrangements" that the Big Bands perform. 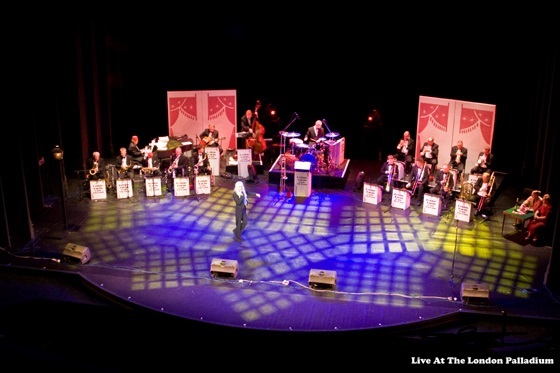 The Big Band music genre continues to survive the years, particularly in television advertising and films. There are numerous professional Big Bands still touring the world today performing concerts, few though with their original band leaders, most are trading on the musical arrangements that the original band would have performed. Factoid: "Big Bands were responsible for emotional imbalance and sexual excess" The New York Times 1941 ! COPYRIGHT NOTICE: Debbie Curtis Big Band & Swing Orchestra, All rights of the owners of all material, text & work etc contained within this website are reserved and protected. Unauthorised public performance, broadcasting or copying is strictly prohibited!